The first of two cards with this title in the box. The second is here. Among other differences, this recipe uses buttermilk instead of sour milk. 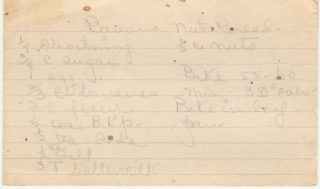 A related recipe in the same box: whole wheat flour banana bread. Also, the above card had the contrast turned up in Photoshop. I don’t really like altering the way a card appears, but sometimes there’s no other way to make it practically legible. But since I want you to experience the box as I do, here’s what it actually looks like. Bake 55-60 min. 350 deg. oven. Bake in loaf pan. Mash bananas and sugar together with a fork. Set aside. Melt shortening. Mix room temperature buttermilk, beaten eggs, and melted shortening. Set aside. 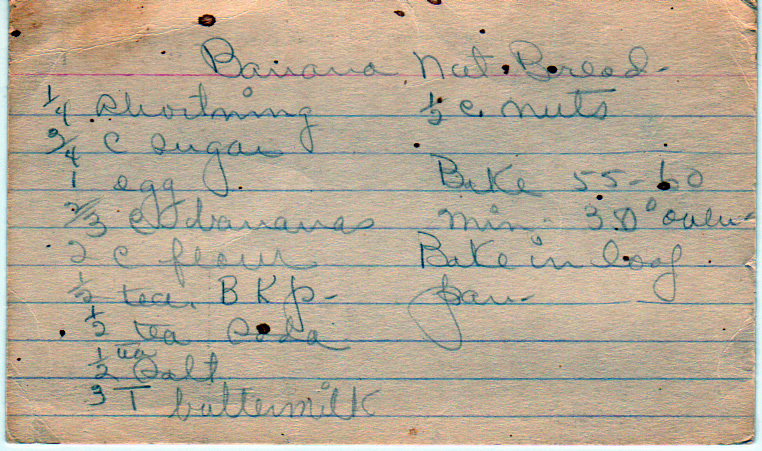 Mix flour, baking soda, baking powder, salt and nuts. Combine the banana mixture and the shortening mixture together. Then, stir the flour mixture into the combined banana and shortening mixture until just incorporated. Fold in nuts. Let stand for between 2 and 10 minutes, depending on the type of baking powder (for most powders, closer to 10; for non-aluminum powders, 2). Bake at 350 degrees for 1 hour or until a toothpick comes out clean. Being an intellectual property fan, I’m always happy to have a trademark story. Milk that has either started to turn or has fully turned sour (as in, expired). Imparts a tangy flavor to the end product in baked goods. Substitute buttermilk if you find you can't bring yourself to intentionally use sour milk.